Like I said, a GOOD children’s book appeals to both adults and children alike. Graphic novels in particular bridge the generations. 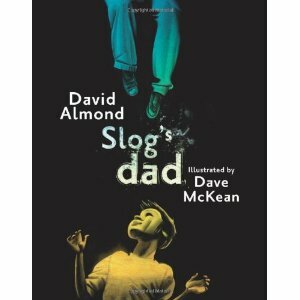 Much like “Slog’s Dad,” a gorgeous, weirdly-wonderful story told by David Almond and illustrated by Dave McKean, who can illustrate ANYTHING. Win a copy of this lovely book by posting your favorite book from childhood. Please include name and email address. No we won’t use your email address for anything creepy. Winner will be randomly drawn Monday, May 9. Thanks and read a book to someone today.